RAW: MMA star Conor McGregor is seen smacking a cellphone out of a man's hand and stomping on it outside the Fontainebleau Miami Beach hotel in new footage of the incident that led to his arrest last month. 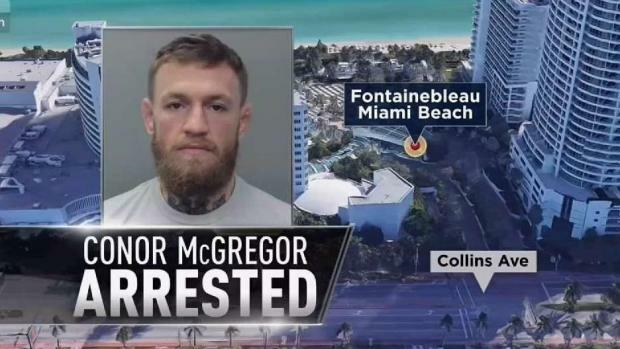 MMA star Conor McGregor is seen smacking a cellphone out of a man's hand and stomping on it outside the Fontainebleau Miami Beach hotel in new footage of the incident that led to his arrest last month. The new surveillance footage, released by Miami-Dade prosecutors Wednesday, shows the 30-year-old McGregor among a group of people outside the hotel the morning of March 11, hours before his arrest on strong-arm robbery and criminal mischief charges. McGregor, wearing white pants and a polo shirt, is seen outside the hotel with his entourage as a few bystanders film him with their cellphones. McGregor suddenly smacks the phone out of one man's hand, stomps on it, then picks it up and starts to walk away, as he's surrounded by his security. An arrest report said the man approached McGregor and attempted to take a picture of him while exiting the hotel around 5 a.m.
NBC 6's Dan Grossman reports on an MMA superstar's arrest. "The defendant slapped the victim's phone out of his hand, causing it to fall to the floor. The defendant then stomped on the victim's phone several times, damaging it," the report said. The report said McGregor picked up the 22-year-old man's phone and walked away. The man told police the phone was valued at $1,000. Police later located and arrested McGregor, who posted bond and left jail hours later. McGregor's attorney called the incident a "minor altercation." "Mr. McGregor appreciates the response of law enforcement and pledges his full cooperation," the attorney's statement read. Meanwhile, Miami-Dade County court records showed that the owner of the phone, Ahmed Abdirzak, filed a lawsuit seeking more than $15,000, accusing McGregor of battery, assault and intentional infliction of emotional distress. Weeks after the arrest, McGregor announced his retirement on social media. McGregor pleaded guilty last year to disorderly conduct in exchange for community service following a backstage brawl in New York City. McGregor's probation period for that case ended less than a week prior to the South Florida arrest.